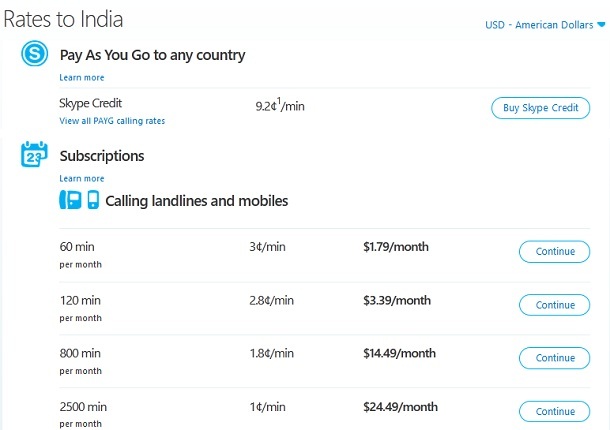 Skype reduces call rates to India : India Calling Plans | Free Pc to Phone Calls, Free Voip Calls to India International ! If you are still stuck with your old telecom provider for your international calls then you are losing a lot of money. It is high time you make a switch to voip (or calling cards) for your international calls and messages and start saving on your phone bills. Skype is probably the thing you should start your voip use. And if you regularly make international calls to India, then we have some good news for you. Skype has again reduced its calling rates to India offering a cheaper voip plan. The news is official with a post on Skype voip blog and the rates are also updated on Skype website. This means that the rates are effective immediately. Using Skype you can now make up to 400 minutes of calls to landlines and mobiles in India for just $8.99/£5.79/€6,69* per month – an effective rate of only 2.2¢/1.4p/1,7c† ($US/£/€) per minute. It doesn't mean that you have to buy minimum 400 minute plan, if you check Skype website then the price for 60 minutes to India are mentioned as €1,39 with effective calling rate same as for other plans. You can choose the plan depending on your per month usage. "You can chat away without the worry, and there are no long-term contracts either. You can make calls from your computer, mobile phone or even from your TV at our great low rates – a monthly subscription is the cheapest way to call phones with Skype. Plus, if you sign up for 12 months, you’ll get an extra 120 minutes per month free, bringing the total monthly allowance to 520 minutes – an even better deal." - Subscription Plans : Buy a plan for as low as 60 minutes per month and your cost reduces to just 2.3 cents per month. If you choose any higher calling plan (check the image), then your call rate reduces further. Cheapest one goes about to 1 cents per minute. Before you jump onto purchase any plan or buy any credit, you should check out the Skype voucher codes (make use of them and avail some discounts). Skype has always been one of the most heard name in the VoIP industry and we would say rightly so. They bring a seamless integration of technology with need to their users. Even though the rate of 2.2cents is not the cheapest but for those who are using Skype anyways it is potentially a great relief. Skype FTW. Great link by Friend... Its awesome . Also I found that we can call Skype numbers from that absolutely free! Zenofon is more than a calling card I believe. How about calling India at 1 cent per minute using direct calling numbers! You also get free 300 minutes FREE! I am seeing a lot of your SPAM comments on this blog about your Zenofon link. This is not the way people will use your invite link. If you really want your link to be promoted on this blog, then you should contact me instead of spamming on the blog. Spamming won't help and it may lead that your account gets banned with zenofon. Thats the working Link! So I guess that should not be considered as spam. Spam is something that is irrelevant and thats a relevant link to this topic. You need to check the definition of SPAM first. You have been posting the same link (same message) again and again on almost every post of this blog and you say that it is relevant to the post. As I have said, you should have contacted me directly instead of posting your link on the blog. I would have certainly included your link in one of the relevant zenofon post. Posting the same link again and again in the comment section of every post will not get you any referrals. And every post here is about free calling or cheapest way to call around the world and this link also says the same... the latest post by you is also about free calling ... you title says" Free Calls to your Facebook friends by Vonage"
So how about if I put comment there that free calls with this link around the world then would you consider that also as spam!